on hate crimes. 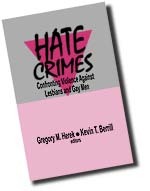 Since the 1980s, the problem of hate crimes has attracted increasing research attention, especially from criminologists and law enforcement personnel who have focused primarily on documenting the prevalence of the problem and formulating criminal justice responses to it. This section of the site reports data from Dr. Herek's national survey of lesbian, gay, and bisexual adults. It is the first study to document the extent of hate crime victimization in a nationally representative sample of sexual minority adults. Also reported here are data from the first large-scale study of the psychological impact of hate crimes based on sexual orientation. These data show that lesbian and gay hate crime survivors manifested more symptoms of psychological distress than lesbian and gay survivors of "random" assaults in the same time period. See Dr. Herek's blog for updates on hate crimes. Learn more about Dr. Herek's national survey and download a preprint of the published paper reporting the study's main results. Learn more about Dr. Herek's study on the psychological consequences of hate crime victimization, download a preprint of the published paper reporting the study's main results, read first-person accounts from victims, get a copy of the research questionnaire, and more. Varieties of Hate Crime Victimization. Personal stories from the participants in Dr. Herek's Sacramento study. Listen to a podcast from KQED-FM's "Forum with Michael Krasny" on Hate Crimes Against Gays, Lesbians, Bisexuals, and Transgenders, featuring Dr. Herek (Broadcast date: July 18, 2006). The "Us" and "Them" of Murder, Dr. Herek's 1998 essay on the Matthew Shepard murder.